If there is a buzzword for gardening, the word of the summer is “pollinators.” Gardeners are becoming concerned about the health of bees, butterflies and other pollinators, and are incorporating plants into their gardens to help these important pollinators. Whether you love veggie gardens or flower gardens, pollinators are what keeps gardens growing! So exactly who are the pollinators? We all know about bees, of course! Butterflies are excellent pollinators as well. But did you know that moths, beetles, flies, hummingbirds and bats are also pollinators? 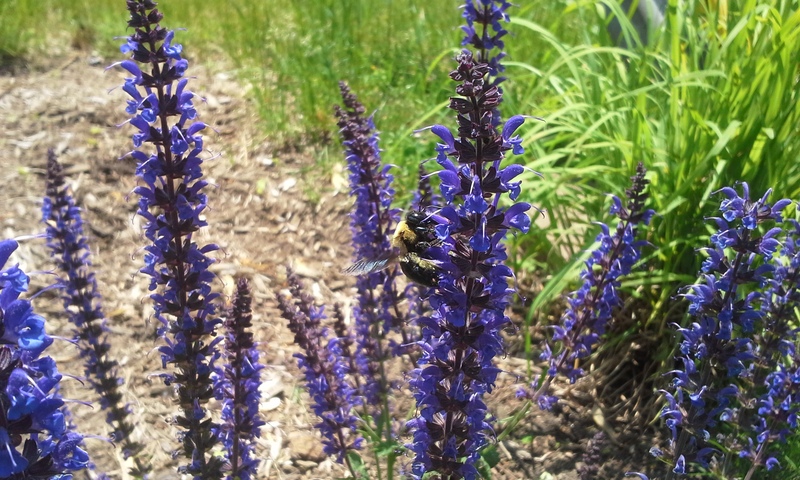 I never thought about these pollinators until I began to plant my own pollinator garden. I’ve even read that mosquitoes can be pollinators, and with all the rain we’ve been getting, there are plenty of them in my yard. I just fed a couple when I went outside to take some pictures for this post! 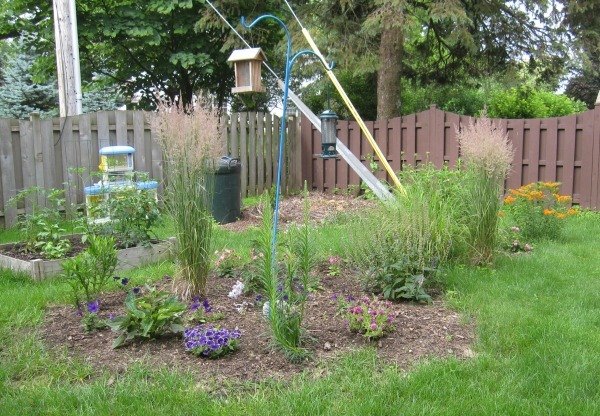 I’ve been learning that it takes time to build a pollinator garden. A couple of years ago, we had a large, old willow tree cut down in our backyard. 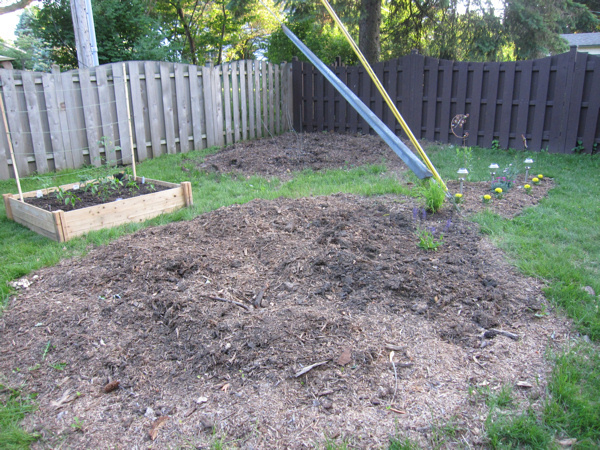 I’ve been using this new sunny space to build our garden. One of the first things I did was visit the “native plant” section of my local nursery. Those plants that I used to see growing in ditches next to farm fields are now much easier to find and are not considered weeds anymore! Black-eyed Susans and purple cone flowers are now deliberately planted in flower gardens to provide a natural setting for our pollinator friends. Last spring, my plants were very small and vulnerable. The rabbit that lives under our bushes loved eating the new, green shoots, especially the leaves of my English aster! I was worried that all that nibbling would kill my plants, but this spring most of them grew back bigger and stronger than ever. I’ve been learning as I go along, and here’s what I’ve learned about growing a pollinator garden. 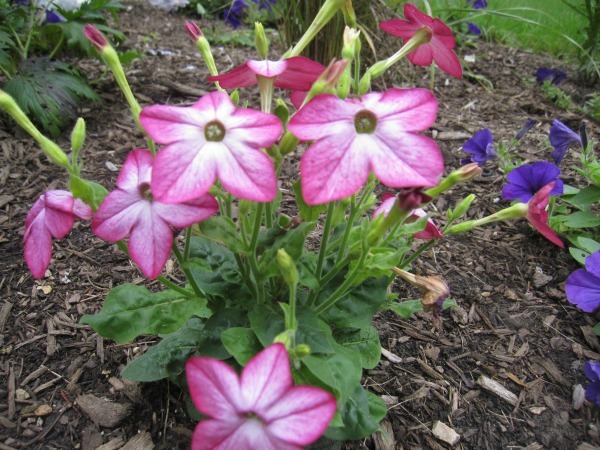 Use plants with a variety of colors and that bloom at different times of the growing season. Different pollinators are drawn to different colors and scents, so a variety of plants will also draw a variety of pollinators. In early spring, my purple salvia bloomed profusely. Bumblebees love this flower! I took a picture of this buzzing bumblebee very carefully! Now my orange butterfly weed is blooming, and it adds a nice pop to my garden. The purple cone flowers are just starting to bloom, but the English aster will bloom later this summer. When I first planted these flowers, I left plenty of room between them, and I’m glad I did! This year they are quite bushy and large. Butterflies need places to lay eggs, and the caterpillars need leaves to eat. 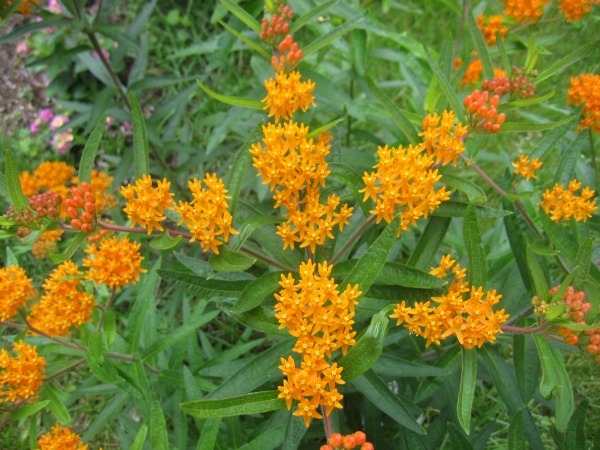 The butterfly weed pictured above is one kind of milkweed where monarch butterflies can lay their eggs. I’m also not going to use pesticides. Last summer, one of my plants was infested by white flies. All I did was spray the plant with a strong jet of water a few times, and the flies were eliminated. There are other friendly ways to take care of pests without removing the bugs you want to keep! Have a source of water. Right now, I have some natural water sources in my yard. The ground has been saturated during our wet and rainy June! I would like to get a birdbath for the hot summer months. The edges should be shallow and sloping for the pollinators to be able to get a drink without falling into the water. To learn more about growing your own pollinator garden, Pollinator Partnership is a great resource. Some of my other City Mom friends are growing gardens with their eyes on pollinators. See how Natasha’s garden at Houseful Of Nicholes is growing food for her table. Katie is preparing for an abundance of zucchini from her garden, and has some great recipes at Three Little Birds and One Messy Nest! I still have some work to do on my garden, but it’s coming along! Do you have a garden? What are you growing?